Heinz Heinrich Nordhoff was born on the 6th January 1899 in Hildesheim. After leaving school he attended the technical college in Berlin and then worked on airplane engines at BMW. In 1929 he moved to Opel and began working in the car industry, Nordhoff gained a few promotions and by 1936 he was Commercial Technical Director and introduced the Open Kadett to the market. By 1942 the German car industry was struggling due to the affects of WW2 and Nordhoff moved to the truck division in the position of Production Director. By the end of WW2, jobs were scarce in Germany and the unemployed Nordhoff found work in a Hamburg Opel garage. At this time the Volkswagen factory was in the hands of the British REME and Major Ivan Hirst was looking to recruit a suitable German businessman to take over the running of the factory. On the 1st of January 1948, Nordhoff was given the position of Managing Director of the Volkswagen factory, enabling Hirst and the British army to be less involved in the day to day running of the factory. The lack of materials at this time was the biggest concern; steel quotas, electrical supplies and rubber components were the main restrictions for the numbers of cars that could be produced each month. The German Industry Administration in Frankfurt was interested in Ford taking over the Volkswagen factory, Nordhoff saw that Ford could provide necessary capital reserves and would lift the export restrictions and supported the idea. In 1948 the Ford company viewed the factory and also the Volkswagen saloon car and thought that both had a great future and were receptive to the take-over plans. Nordhoff and Colonel Charles Radcliffe worked on a proposal that would require Ford to buy a share of Volkswagen, but that would not constitute a full take-over. Ford were less keen on a deal that was not a full take over and with the Berlin blockade in operation as well, Ford decided not to continue with the deal. 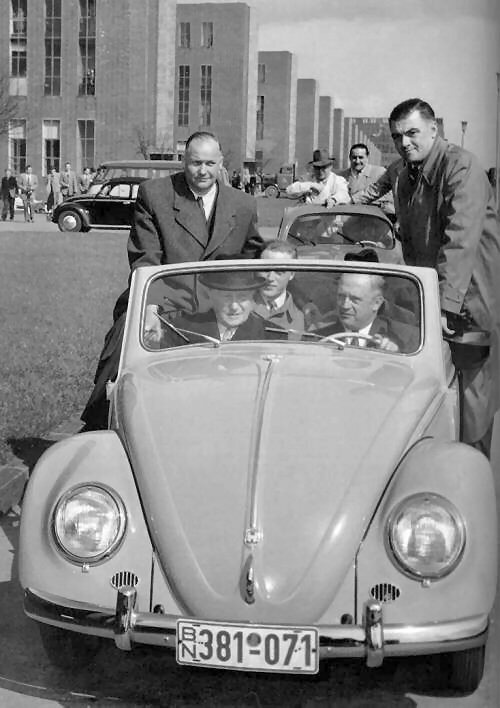 Nordhoff was not entirely convinced by the Volkswagen's unconventional engineering and had been approached several times to defect to Ford, but he stood by the reliable Beetle and put in place a program to constantly improve it's design. In 1948 Nordhoff knew that for Volkswagen to grow further, it would need an expanded model range and it would need to improve export sales. To add to the range without introducing a new car, two further Beetle body styles were to be explored - a four seater convertable made by Karmann and a two seater convertible made by Hebmüller. In addition to these body styles, Nordhoff also wanted to work on a suggestion a few years earlier from Dutch importer Ben Pon. Pon's idea was to use the Volkswagen base to create a commercial vehicle, similar to the Vehicles he had seen being used in the VW factory to move parts around. An export model was also to be introduced that was less utilitarian than the domestic Volkswagen in order to appeal more to foreign buyers. In May 1949 – VOLKSWAGENWERK AG was formed and then in October '49 the British Army officially handed back the Volkswagen factory to the Germans, the same year that these new models were released. In 1950, Nordhoff assigned Max Hoffman as the Volkswagen importer for the US, but this contract was cancelled in 1953 due to lack of sales. 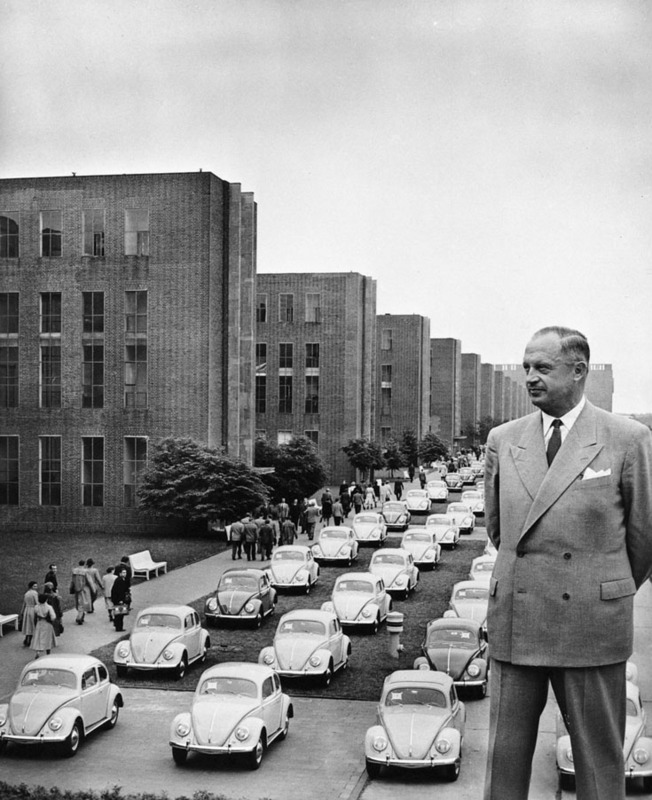 Instead, Nordhoff set up Volkswagen of America in 1955, and in that year 32,662 Beetles were sold. The Volkswagen would became the country's top selling imported car, with sales peaking in 1968 when 423,008 cars were sold. 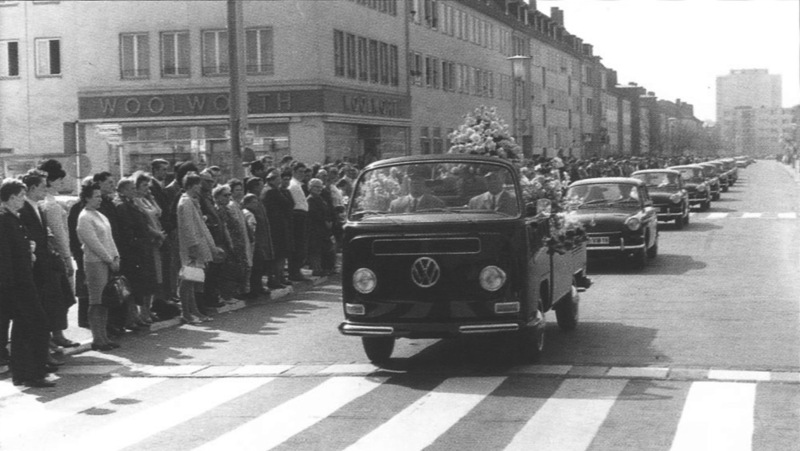 When Nordhoff died of a heart attack in 1968, such was the affection and appreciation for him among the German people for the prosperity that he had brought them, thousands of people lined the streets of Wolfsburg to view the funeral procession. 27624449 page views since 8th October 1999. There are currently 121 users on the site.